My name is Laura Komar and I am taking a stand against childhood cancer by joining the Steve Stefani Dance Marathon at Springfield High School. Raising money for pediatric cancer is very important to me because on December 19, 2011 my older brother Mikey was diagnosed with a brain tumor. He went through radiation and chemo therapy for about a year. This was the longest year of my family's life. He was in remission after his fight. After almost 3 years of being in remission his cancer came back and it came back stronger. He fought his hardest while still doing the things he loved. In November of 2017, Mikey's cancer started to overthrow him. He fought so hard for the next 5 months but in March of 2018, the cancer finally overthrew him at the age of 17. My brother did not lose his fight to cancer, he won the fight for 7 years and it was just his time to be free. He was my hero for the past 7 years and still is my hero. The fight to end childhood cancer is so dear to my heart and I would be so grateful for anyone that tries to help me and many others support this. Please help me by donating, anything helps. SSDM is an organization that supports Four Diamonds. 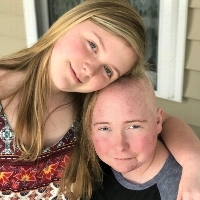 I hope you can help me support ending childhood cancer.